NOTE: This is the first in a series of articles looking at U.S. and global venture capital investments in wine-oriented technology, sales, transportation, and allied areas. 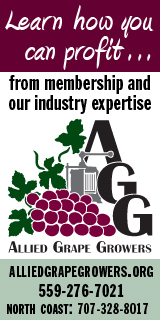 The rational for this new feature can be found at: Wine industry missing out on investment due to its lack of financial transparency. Data has been collected by Wine Industry Insight using its best efforts from web sites, public statements, news releases, regulatory filings, company data, correspondence and other sources including Inside VC, Tech Crunch, Venture Beat, Bloomberg, Wired, TheStreet.Com, MarketWatch, Business Wire, Reuters, tips from investors. Because of the often-sensitive nature of financial investments, a lack of a central information source, and the varying credibility of some sources, these data are inevitably an incomplete glimpse. 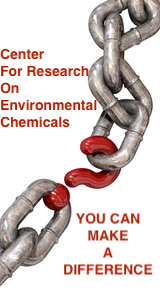 Articles and tables will be updated as better information becomes available. 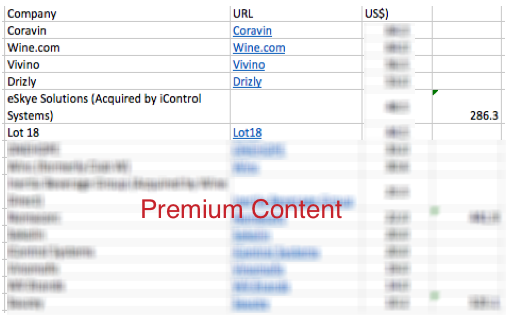 Please see “Wine industry missing out on investment due to its lack of financial transparency” for information on why Wine Industry Insight has initiated this coverage and why private deals with undisclosed terms are irrelevant and counterproductive for investment. This series will focus almost entirely on venture capital because public data on other investment types is sketchy. CAUTION: This information is designed to be informative only. While best efforts have been made to assure the accuracy of data, that is not guaranteed. This article should not be considered investment advice. It should not be relied upon for investment purposes other than as a possible starting point for proper due diligence. Much has been written over the past few years about China’s impressive gains in appreciating fine wine and the development of its own fine wine industry. The most prominent investments covered in the media have been private investments in European chateaus and Napa Valley estates and vineyards. Unnoticed until now is the fact that China’s venture capital investment in wine-oriented technology, online sales and export/import capabilities has blown away that of the United States and the rest of the world. 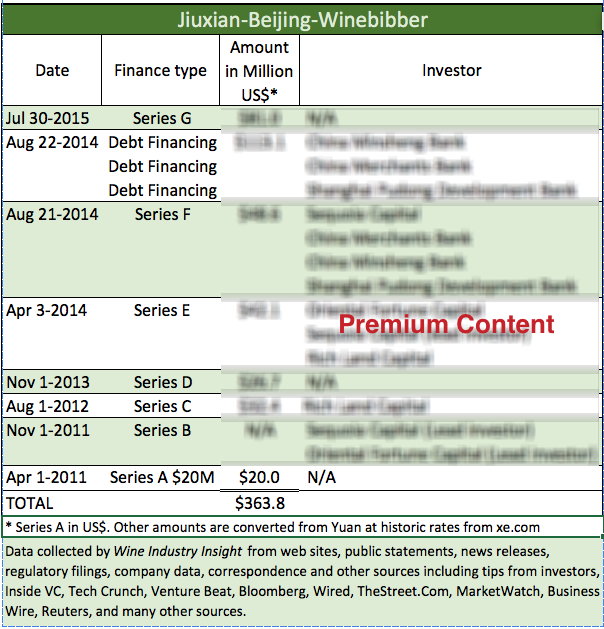 The situation is so striking that the largest venture investment in China — Juxian.com/Beijing Winebibber– is six times greater than Coravin, the largest in America. 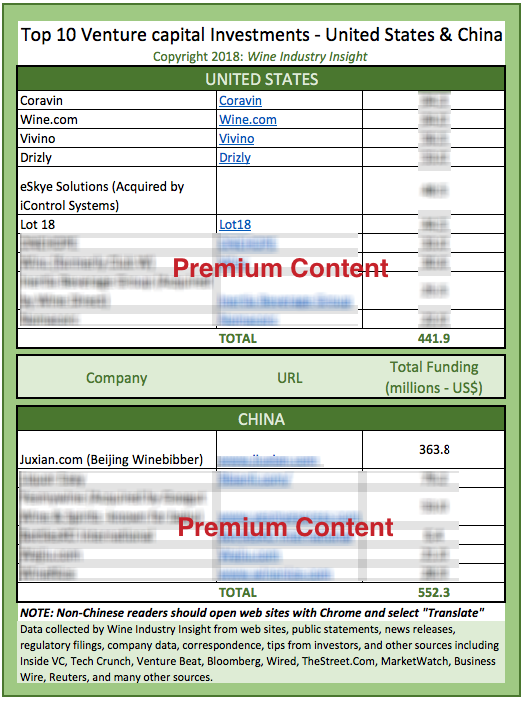 What’s more, a look at the chart above shows that the venture investment in Juxian.com/Beijing Winebibber is larger than the sum of the six-largest U.S. companies combined. Not only that, but venture capital invested in the the top six Chinese companies ($552.3 million) is greater than the combined total of the top 15 U.S. companies. Of course, this list is incomplete — as are all lists of private investment — because most wine transactions are carefully guarded secrets. This article explains why undisclosed transactions discourage investors and companies seeking capital. Not only was a U.S. VC giant the co-lead investor in the unspecified Series B finding, but it also led the $42.1 million Series E and participated in the $48.6 million Series F funding. 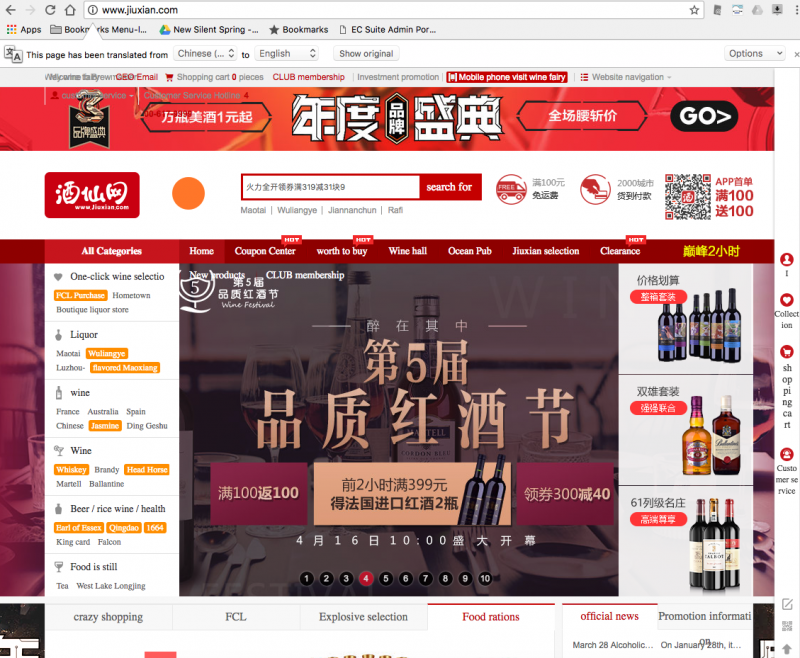 According to Juxian.com, it focuses on importing wine, red wine, liquor, Shaoxing wine, and more and sells it via the ecommerce site, Beijing Winebibber.